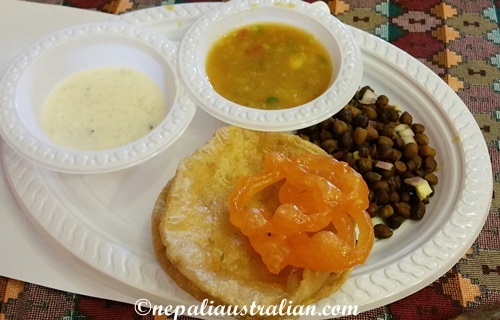 It always feels great when we discover something authentically Nepali in Sydney. Sometimes in life, even a small thing can make you happy and that is what I felt when we discovered that there is a Nepali restaurant which serves Nepali style breakfast. I think everyone has fond memories from their childhood and one of mine is yummy food for breakfast when in Nepal, like gwaramari, puri, malpuwa, jeri, swari and other delicacies. It is not every day that we eat these foods but usually on weekends I would wait for my dad to come home with some for us. Last week, one of our friends mentioned that, a Nepali restaurant is serving Nepali style breakfast on the weekends. I couldn’t wait to go and taste them so we went there on Sunday along with my parents and some friends. We heard that the place gets busy very early and the last time our friends were there they had to wait a while for a table so we went early and I was happy to see most of the tables empty. It was an all-you-can-eat buffet style breakfast. They served puri, jeri, potatoes curry, brown chick peas, kheer (rice pudding) and tea. I took a bit of everything and I really enjoyed the breakfast. AS, my parents and friends were very happy with the breakfast as well. Chhori ate some rice pudding and some puri too. These days she really enjoys our food so we try to feed her a little of everything. The owner was very accommodating as well giving us jeri without sugar syrup fresh off the stove and sugarless tea as my dad is diabetic. What is your special breakfast? Have you tried any Nepali treats? 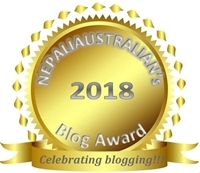 This entry was posted in adora, Foodie, Nepal, Nepali food and tagged australian, gwaramari, jeri, M from nepaliaustralian, malpuwa, Nepal, Nepali, nepali food, Nepaliaustralian, Puri, swari. Bookmark the permalink. Sydney was nothing like this when I first came here. It was hard to meet Nepali people and Nepali food was impossible to find. But these days there are some suburbs where there all high number of Nepali household with Nepali grocery, Nepali restaurant, Nepalese owned cafes , hair saloon, mobile shops, sari shops and other business as well. We live in a area where there are so many Nepali people that my dad can go out and meet new people on his own. Hehehe I don’t have sweet-tooth either bit this was a exception. Have you tried other Nepali food as well? I woke up hungry at 6:45 am and the first thing I see is your blog about Nepali breakfast. I could eat a large bowl of potato curry right now and I do feel like something savoury but I guess I’ll have to settle for my usual oatmeal with raisins, dried cranberries, cinnamon and chopped apple. Have a nice Monday there, Australian. Very nice blog ma’am, I hope you have a great week, stay safe, God bless. That sure sounds lovely. Haha.. I can imagine what it does to our bodies eating this food for breakfast every day ;). I have been to one here, the one I really recollect having is the salty butter tea (?) Served in a tea-pot for the table. I liked it. Is Jeri a part of regular breakfast menu?